Dyslipidemia increases the risk of atherosclerotic cardiovascular disease and is incompletely reversed by statin therapy alone in many patients. Thyroid hormones lower levels of serum low-density lipoprotein (LDL) cholesterol and has other potentially favorable actions on lipoprotein metabolism. Consequently, thyromimetic drugs hold promise as lipid-lowering agents if adverse effects can be avoided. In this 12-week trial, the thyroid hormone analogue eprotirome was associated with decreases in levels of atherogenic lipoproteins in patients receiving treatment with statins. Similar reductions were seen in levels of serum LDL, apolipoprotein B, triglycerides, and Lp(a) lipoprotein. 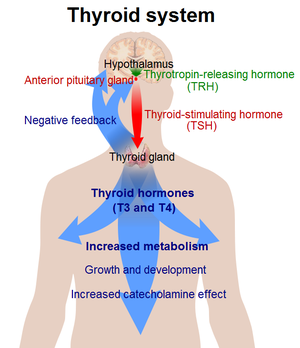 No change in levels of serum thyrotropin or triiodothyronine was detected, although the thyroxine level decreased in patients receiving eprotirome. Use of the Thyroid Hormone Analogue Eprotirome in Statin-Treated Dyslipidemia. NEJM, 2010.
when do we expect to see the first thyromimetic fda approved ?